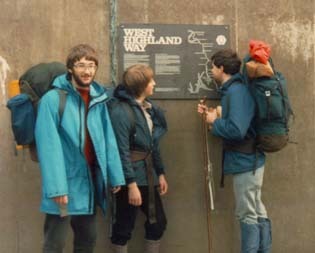 September 1983 Do the West Highland Way, a one hundred mile walk from Glasgow to Fort William with Kevin Clarke (Min) and Dave Elks. Swan hire car had been booked for 4am but did not turn up. Get a Hertz one and set off at 10.40am, 6 hours late. Arrive in Glasgow at 5.45pm, find Milngavie. Drove to a campsite near Loch Lommond, about 18 miles outside Glasgow. It was raining and the ground was very wet. Two thirds of us discuss going back for last orders in the Coach and Horses, Horsley. Had a wet, windy, miserable night. Dave wakes up at 6am and makes porridge, for some reason he has promised to do for the duration of the trip. Still raining, more debate whether to go home. Pack away and leave by 7.40am. Drive to Milngavie, acquire a map and a guide. Started walking at 9am, telephoned Hertz to pick up the car. We are all carrying 45 lb rucksacks. After about 12 miles we are pleasantly surprised when a hotel turns up. Stop for a quick drink and a bite to eat. Min reckons that we can make the Y.H., about another 12 miles, by dark. After plodding 6 miles through the rain it is clear that we won't. Get to the campsite at 6.30pm. It rains all night. Rather tired ! The team's bodies are not in good condition. Started walking (hobbling really) at 9.15am. Crawled on till 11.30 when arrived at the Rowardennan Hotel, waited for a meal till 12.15, left the pub at 1pm. After walking (some people in pain i.e. Dave moaned a lot) 7 miles we arrived at the Inversnaid Hotel, a great place on the banks of Loch Lomond. We go into the bar and ask if they have any food. We are offered the left-overs from the restaurant, which turns out to be a fantastic meal, leave a £1 tip. I had breakfast in bed, so did Min again. Get moving by 8.20am, quite sunny, nearly shorts weather. Did the toughest part of the walk without realising it today. Got to a very Scottish pub, Inveranan House Hotel, talked to a couple from Bridlington. Dave expressed ideas (he was certain) of catching the train home. After five cups of coffee he was a changed man, he decided to push on for another couple of days. Saw mountain goat, grey squirrels, kites. Got into Crianlarich, I have some problems finding the Y.H., go to the Crianlarich hotel for some food. Dave approaches a young woman with the classic chat-up line "Don't I know you from somewhere ? ", it turns out to be someone from his university course (another bet lost) who was doing vacation work at the hotel. Late night, bed for 10.45pm. We all had a lie in, Dave did not get up till 7.30am. The drying room had not been switched on so everything is still soaking wet. Leave the hostel at 9.20am, I carry the map, somehow we got lost. We have a brief disagreement as to the location of the path, resulting in Dave going up the path to the top of the hill, me and Min going through wet grass lower down. We do 2 miles in 2 hours. Reunited walking along the old main road. Stop at the Tyndrum hotel for dinner. 1� miles to go to the Bridge of Orchy, Dave decided to walk fast, gets there in 25 minutes. Camped just over the river from the hotel. Spend all evening in the hotel bar. Meet a lad from Glasgow who has done the way before and is now doing all the Munroe's. Meet two other friends in the bar, good night chatting. Dave oversleeps, does not get up till 6.45am, I have porridge in bed again. I was kept awake by the noise of the river. Leave the campsite at 8.20am. Raced over to Inveranan, get there in 50 minutes. Also go quickly to the Kingshouse hotel, there for dinner at 1pm. Laze around in the sunshine, play in the river. By far the best weather that we have had. Go down to the hotel bar in the evening, lots of long distance walker are in. A few seem to be walking the length of the UK by connecting various long distance footpaths together. They are having their dole money re-directed to post-offices along the way. Heavy frost, knocked ice of the tents, get going for 8.10am. Went up the Devil's staircase, see Glencoe, also good views of Ben Nevis. Meet ten other walkers doing the route north to south. Get lost on the way down to Kinlochleven. No bars open so we watch some lads playing football. Walked on the campsite, bed for 8pm due to loads of midges. After a good ten hours sleep, we use the last of the porridge for breakfast. Overcast morning, set off at 8.15, walk back to Kinlochleven. Sweaty climb up to Caulderfield's Military road. Dinner is 5 Mars bars and a bit of old cheese. Leave the military road and bog hopped over to Glen Nevis, lots of up and down. Get to the Y.H. for 2.20pm. We have a big meal and then walk into Fort William. We talk Dave into having three pints of cider.